Every year, Texas Monthly publishes much-anticipated reviews of some of the state’s best medical, legal, and community leaders, based on a strict and independent research process that identifies Texans who have attained a high degree of peer recognition and professional achievement. Dr. Larry Balli, one of the area’s most influential dentists, has long enjoyed a stellar reputation in Edinburg. Late last year, he was bestowed the coveted honor of "Super Dentist" by Texas Monthly, a major statewide magazine with a national following. Now comes news that his professional and civic contributions to the region have earned him praise from Gov. Rick Perry and the Texas Legislature, which have approved a legislative resolution publicly recognizing him for his efforts in the Lone Star State. See lead story later in this posting. 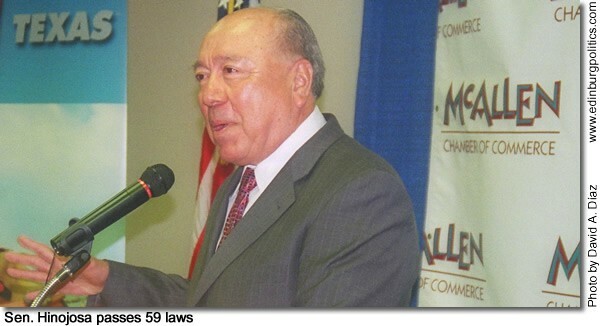 As the veto period came to a close on Sunday, June 21, Sen. Juan "Chuy" Hinojosa, D-McAllen, featured here during a McAllen Chamber of Commerce legislative update on Wednesday, June 17, announced final approval of 59 measures that he authored or sponsored. Hinojosa’s legislative package includes bills on transportation, natural resources, criminal justice, infrastructure, and health care issues, benefitting South Texas and the entire state. See story later in this posting. 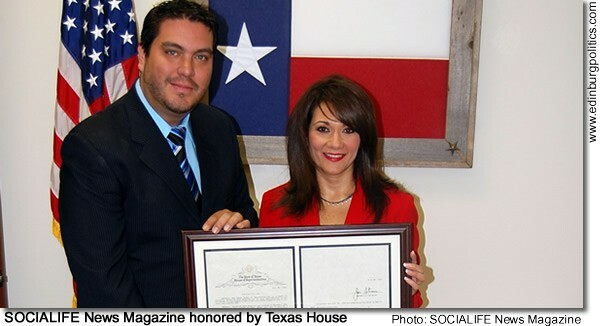 SOCIALIFE News Magazine, the five-year-old creation of South Texas entrepreneur Pepe Cabeza de Vaca, featured here with Rep. Verónica Gonzáles, D-McAllen, has been honored by the Texas House of Representatives for its vital role of promoting a positive image of the Rio Grande Valley and by helping charitable organizations in the state and nation. The honor, contained in House Resolution 2283 filed by Rep. Verónica Gonzáles, D-McAllen, was unanimously approved by House of Representatives on May 25. See story later in this posting. The laboratories at McAllen Heart Hospital and McAllen Medical Center were accredited by the College of American Pathologists (CAP) after site inspections on April 1 and May 1. Both laboratories received complimentary remarks by CAP inspectors on the quality of patient testing, documentation and organization. The laboratories also received exemplary marks on their standard of laboratory practices. 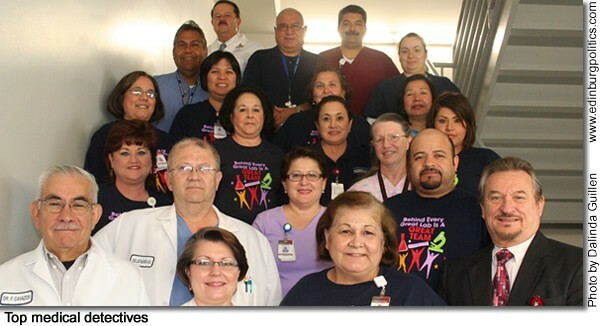 Featured here are some of the employees of McAllen Medical Center and McAllen Heart Hospital who are instrumental to the quality of care and services the laboratories provide. From left, first row: Dr. Feliberto Cavazos, pathologist; Sobie Treviño, system assistant director; Grace Garza, system lab director; and Robert Tamez, hospital administrator. Second row, from left: Dr. José Luis Valencia, pathologist; Norma Rodríguez; and Lester Alvarado. Third row, from left: Denisha Niño; Aida Galván; Diana Villarreal; Janice Milford; and Jennifer Ríos. Four row, from left: Elisa Díaz; Mylene Trasmonte; Becky Flores; and Sylvia Aguinaga. Fifth row, from left: Virgil Zuñiga; Robert Hockaday; Alejo Romero; Andy Romero; and Aydee García. See story later in this posting. 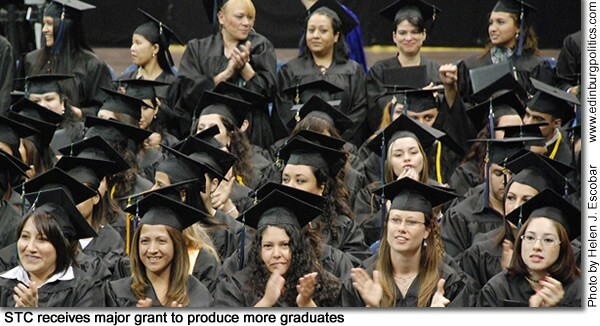 Hundreds of future South Texas College graduates, such as these featuring during this spring’s commencement exercise, will benefit from a major grant, to be dispersed over the next three years, for expanded development education programs. On Monday, June 22, STC leaders announced that the college has been named as one of 15 national recipients – and only four in Texas – of a new grant from the Bill & Melinda Gates Foundation and MDC, Inc. Together the groups are giving $16.5 million to community colleges across the nation, $743,000 of which will come directly to South Texas College. “At STC we are so happy to receive the funds because it will help us institute a change to the respective course contents in our developmental programs to create learning connections for students among the three developmental education disciplines through contextualization of the curriculum,” said Dr. Ali Esmaeili, dean of developmental studies for STC. “We plan to implement a robust case management student support framework to ensure a consistent and reliable contact experience for all of our developmental students.” See story later in this posting. 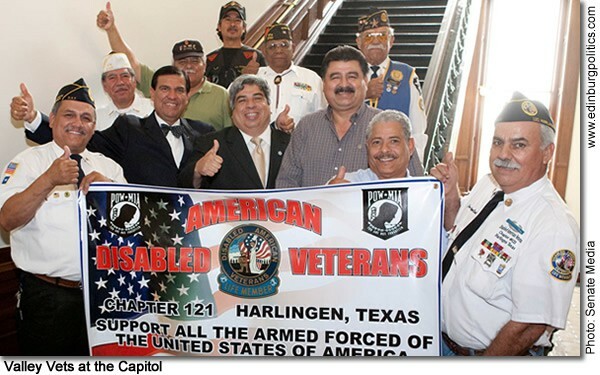 Rep. Ismael "Kino" Flores, D-Palmview, flanked by leaders of local veterans’ groups, on Thursday, June 11, explained why he took on powerful legislative enemies in order to get his bill passed that will provide up to a 100 percent home property tax break for thousands of disabled veterans. "We veterans, we don’t leave anyone behind, and I wasn’t about to leave these veterans behind," Flores said during a press conference organized by the Veterans Alliance of the Rio Grande Valley. The group chose the Rio Grande Valley State Veterans Cemetery in Mission as the site for the news event, noting that Flores had also been the principal architect in bringing the state veterans cemetery to the Valley. Despite behind-the-scenes legislative opposition to his measure, Flores, a U.S. Army veteran, outmaneuvered his political rivals and passed the veterans’ home tax break. Flores praised Texas veterans groups for playing a key role in the measure’s hard-fought success. See lead story later in this posting. 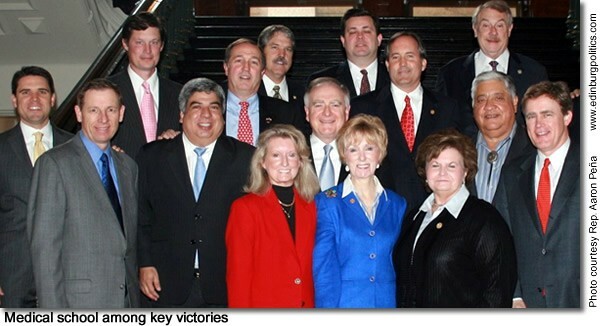 Sen. Juan "Chuy" Hinojosa, D-McAllen, featured first on right, was rated as one of the best state lawmakers in Texas by Capitol Inside, a non-partisan web site news service has been a big hit with Republicans, Democrats and diehard independents as well since making its debut online in January 2003. At the conclusion of each legislative session, several political publications and websites name best and worst performers based on their service to their districts and the state. This year, Capitol Inside and political strategists Ted Delisi and Harold Cook compiled top ten lists, each naming Sen. Juan "Chuy" Hinojosa, D-McAllen, as one of Texas’ top ten legislators. Capitol Inside referred to Hinojosa as a veteran legislator that "just keeps getting better." The Delisi/Cook list noted Hinojosa’s ability to secure funding for District 20 projects, including highway infrastructure, and millions of dollars for health care delivery services. 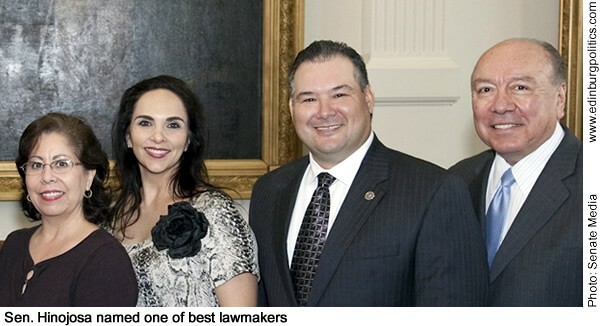 From left, during a recent visit to the Capitol, are Hidalgo County Treasurer Norma G. García, Hidalgo County District Clerk Laura Hinojosa (no relation to the senator), Hidalgo County County Clerk Arturo Guajardo, Jr., and Hinojosa. See story on the Capitol Inside ranking later in this posting. South Texas firefighters were among the dozens of area groups which visited state lawmakers at the Capitol during the recently-concluded five month regular session. 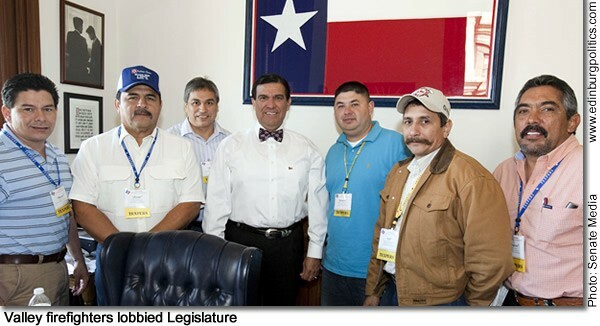 On Wednesday, April 1, a Valley delegation brought their issues to Sen. Eddie Lucio Jr., D-Brownsville. Featured with Lucio, in his office, are, from left: Manuel Vargas, McAllen; Raul R. Zúñiga, Jr., San Benito; Javier Gutiérrez, McAllen; Lucio; Ramón Martínez, San Benito; Jesús Tijerina, San Benito; and Ernest Abrego, Harlingen. Later in this posting, Lucio writes about several key measures approved by the Legislature that will benefit another key constituency – military veterans. 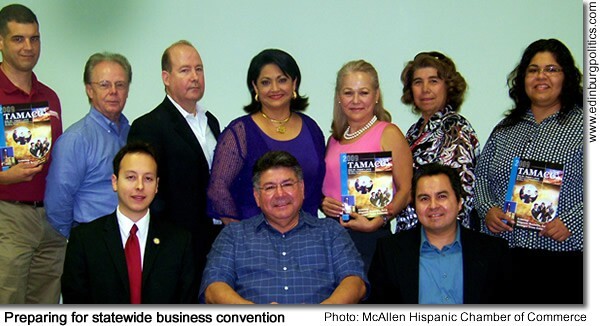 The Convention Committee of the McAllen Hispanic Chamber of Commerce is finalizing plans for the 34th annual Texas Association of Mexican American Chambers of Commerce (TAMACC) Convention, which this year will be held at the McAllen Convention Center from July 29 through August 1. The theme to the convention is “Growing Hispanic Business, for a Stronger Texas Economy”. Featured, front row, from left: Sam Guzmán, TAMACC president; Froy Garza with Congressman Henry Cuellar’s office; and Salomon Torres with Congressman Ruben Hinojosa’s office. Back row, from left: Rick Carrera, University of Texas-Pan American Small Business Development Center; Dr. John Thomas, MHCC board of directors; Mark Winchester, UTPA’s Director of the Rio South Texas Regional Procurement Technical Assistance Center; Cynthia M. Sakulenzki, MHCC Pres/CEO; Letty Flores with Gov. Rick Perry’s office; Margie Treviño, Southern Minority Supplier Development Council; and María Juárez, UTPA Director of the Small Business Development Center. See story later in this posting. The Edinburg Chamber of Commerce will host a Power Punch @ Lunch on Wednesday, June 24 at the Depot, located at 602 W. University Drive, sponsored by Doctors Hospital at Renaissance (DHR). The business community of Edinburg and the Rio Grande Valley are invited to attend the free networking luncheon from 11:30 a.m. to 1 p.m. Persons who attend are being asked to bring their business cards to distribute during the chamber’s most notable social-networking luncheon, which includes food, door prizes and fun. Area residents interested in attending should RSVP by calling 956/383-4974. 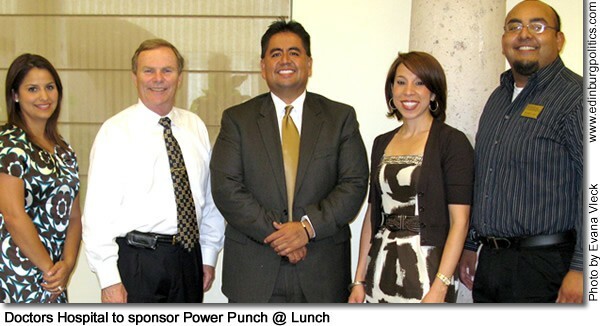 Featured, from left: Joanna Álvarez, DHR Assistant Director for Marketing; McAllen City Commissioner Jim Darling, who serves as DHR’s legal counsel; Mario Lizcano, DHR Director for Marketing; Marissa Castañeda, DHR’s Chief Operations Officer; and Frank Lara, Membership Director, Edinburg Chamber of Commerce. The nomination of Judge Sonia Sotomayor of the United States Court of Appeals for the Second Circuit appears to have caused some confusion among members of the media and news consumers, according to the National Association of Hispanic Journalists. That organization is encouraging news organizations to avoid any confusion over Sotomayor’s ethnic background. Her Puerto Rican parents are not immigrants, as some journalists have reported, since island-born residents are U.S. citizens, conferred by an act of Congress in 1917. "People who move to the U.S. mainland from Puerto Rico are no more immigrants than those who move from Nebraska to New York," said Iván Román, NAHJ’s executive director. "Her nomination to replace Justice David H. Souter represents the possibility of the first Latino sitting on the nation’s highest court. As the debate over her qualifications develops, NAHJ would encourage the highest form of discourse." 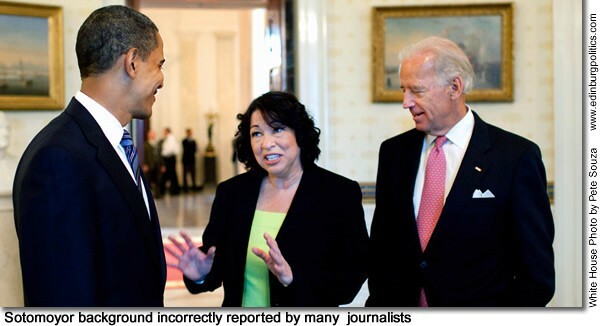 Sotomayor, 54, is featured here on May 26 with President Obama and Vice President Biden following her nomination by the president to the U.S. Supreme Court. 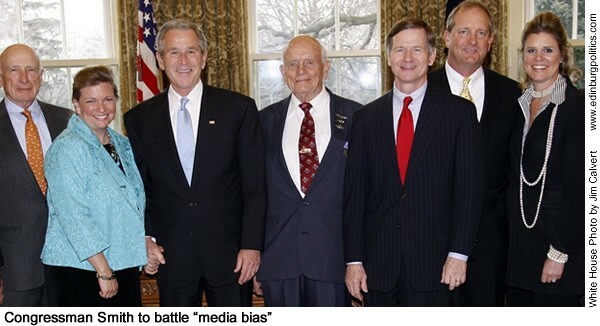 Congressman Lamar Smith, R-San Antonio, featured here, third from right, during an unrelated photograph with constituents and then-President Bush, on officially launched the Congressional Media Fairness Caucus (MFC) to counter what he says is media bias. The purpose of the MFC is not to censor or condemn, but to encourage the media to adhere to the highest standards of reporting and to provide the American people with the facts, balanced stories and fair coverage of the news, Smith contended. A study by the nonpartisan Center for Media and Public Affairs found that network news programs gave President Obama more than three times the coverage that they gave former President George W. Bush early in his presidency, Smith noted. See related story later in this posting. Rep. Aaron Peña, D-Edinburg, featured here, front row, second from left, with fellow members who first came into the Texas Legislature with him about six-and-a-half years ago, on Friday, June 5, declared that legislation authorizing the establishment of a medical school in the Rio Grande Valley was his and the region’s number one legislative priority. "The Rio Grande Valley has been long underserved in access to healthcare and health care providers," said Peña. "The establishment of a medical school and health science center will not only serve to bridge that gap but it has the power to transform our economy. I applaud Sen. Eddie Lucio for his leadership, our legislative delegation and community and business leaders for all their efforts. While we can relish this achievement we have a lot of important work ahead to ensure that the facility is fully funded and world-class." See story later in this posting. The employees of South Texas College have been recognized by the United Way of South Texas for being the most charitable among all staffs at state agencies across the Rio Grande Valley, including outperforming other major universities and state offices. STC employees pledged more than $40,000 through the 2008 State Employees Charitable Campaign (SECC), administered by the United Way of South Texas. The college merited the SECC Lone Star Award for its effort. Featured, representing STC and UWST, are, from left, front: Gloria Ann Hernández, community relations public sector campaign for UWST; Thelma Garza, UWST president; and Diana Peña, vice president of Finance and Administrative Services for STC. Back row, from left: Dr. Shirley A. Reed, president of STC; Jeff Heavin, instructor, STC Human Resources Specialist Program; and Shirley Ingram, Director of Human Resources for STC. See story later in this posting. Paul Cowen, longtime chief-of-staff for Sen. Eddie Lucio, Jr., D-Brownsville, and an alumni of then Pan American University, on Monday, June 1, was honored by the Senate for his legislative work on behalf of the Valley and Texas. Cowen will be leaving his Senate post on August 31. “Paul has been the most loyal employee and friend. His enormous contributions to state government and to the people of District 27 will never be forgotten,” said Lucio. 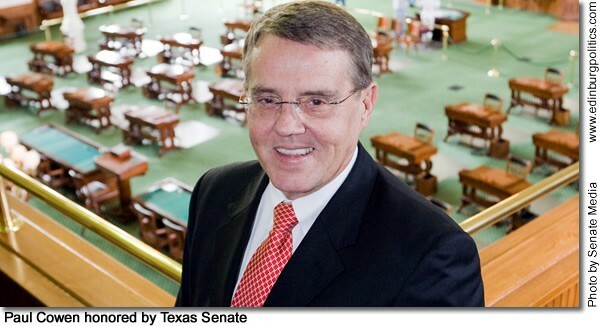 “His work has been exemplary and of the highest quality, and as one of the Texas Senate’s most valuable employees, he will be greatly missed by all of us.” See story later in this posting. “Little Women” author Louisa May Alcott once said, “helping one another is part of the religion of sisterhood.” No need to tell that to the “Trigo sisters” of Edinburg, as they have come to be known in the College of Education at The University of Texas-Pan American. 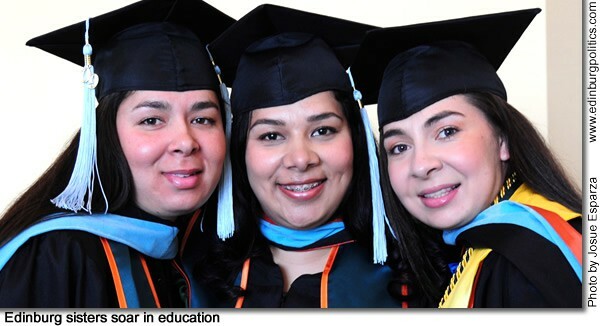 The three siblings – featured from left, Elda Trigo, Armidia Trigo Ríos, and Iliana Trigo – all celebrated earning their master’s degrees at the same time in the same field – bilingual education – at one of three UTPA commencement ceremonies held May 9 at the McAllen Convention Center. See story later in this posting. Julissa Barrera, shown second from left, learned over her years as a student at The University of Texas-Pan American that leadership requires creativity, determination and perseverance. For her final project as a member of the four-year Student Leadership Program at the university, Barrera created, researched and implemented a drive in which she successfully collected nearly 8,000 diapers to give to clients of AVANCE Rio Grande Valley, a local nonprofit agency providing services to lower income Valley families. Featured at a recent ceremony to present diapers to AVANCE RGV collected as a part of a UTPA Student Leadership Program senior project are, from left: Noelia Telles, family service coordinator for the Parent/Child Education Program, AVANCE RGV; Julissa Barrera, who graduated this spring; Cecilia Quiroga, parent educator for the Parent/Child Education Program, AVANCE RGV; and Teresa González, supervisor of family programs, AVANCE RGV. See story later in this posting. Top leaders with South Texas College and Texas A&M-Kingsville recently signed an agreement to ease the transfer of students studying education. Featured, seated from left, are: Steven Tallant, TAMUK president; Juan E. Mejia, STC vice president for academic affairs; and Ali Emaeili, STC dean for bachelor programs and university relations. Standing, from left, are: Marilyn J Bartlett, TAMUK dean of the College of Education; Art Montiel, chair of STC’s Education Department; and Mike F. Desiderio, TAMUK chair for education. See story later in this posting. 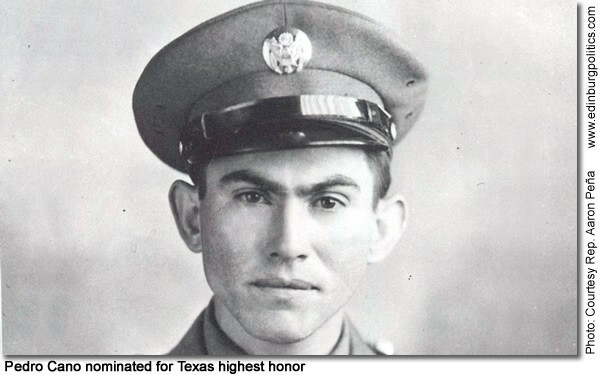 The Texas Legislative Medal of Honor Committee has met and approved Private Pedro Cano of Edinburg as the posthumous recipient of the state’s highest military decoration. "I am pleased to report that the committee has made the formal selection of Pedro Cano to be the Legislative Medal of Honor recipient for the 81st legislative session," said Rep. Aaron Peña, D-Edinburg. "Pedro Cano’s heroism will always speak for him but the testimony given by our local veterans and the Cano family was instrumental in moving the committee’s formal nomination." Peña is the author of HCR 5 which would posthumously confer the Legislative Medal of Honor to the World War II hero. Members of the nominating committee are: Texas Adjutant General José Mayorga; Lt. Gov. David Dewhurst; Speaker of the House Joe Straus; Sen. Leticia Van De Putte, D-San Antonio, who is chair of the Senate Veterans Affairs and Military Installations Committee; and Rep. Frank Corte, R-San Antonio, who is chair of the House Defense & Veterans’ Affairs Committee. After review of testimony and evidence, Mayorga made the motion for the nomination of Pedro Cano. Cano was not the only candidate up for consideration at the hearing held on Friday, May 15. HCR 5 is a step away from being approved, with the Senate scheduled to hold a public hearing on the matter on Wednesday, May 20, with Sen. Juan "Chuy" Hinojosa, D-McAllen, serving as the Senate sponsor. Cano received the Distinguished Service Cross, the nation’s second highest military honor, for his heroism in WWII. Cano would be the second recipient from Edinburg to receive Texas’ highest military decoration. 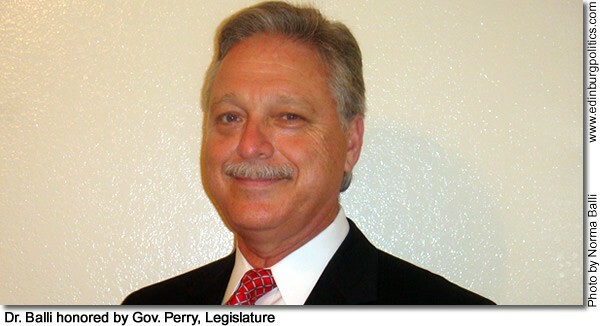 In 2007, Peña passed legislation posthumously conferring the Texas Legislative Medal of Honor to Freddy González, also of Edinburg. González was a Marine sergeant, killed in Vietnam, who was posthumously bestowed the Congressional Medal of Honor. Sen. Eddie Lucio Jr., D-Brownsville, and Rep. Aaron Peña, D-Edinburg, recently greeted a Rio Grande Valley delegation of veterans visiting the Austin Capitol to voice support for their issues, including a Veterans Hospital in the area. "The federal government received a clear message from the Texas Legislature that the Rio Grande Valley needs a hospital for veterans of South Texas," said Peña. "I offer my sincere appreciation to those veterans who traveled to Austin to testify on this legislation and to Sen. Lucio for his work on this issue. Together we are going to get this hospital built. 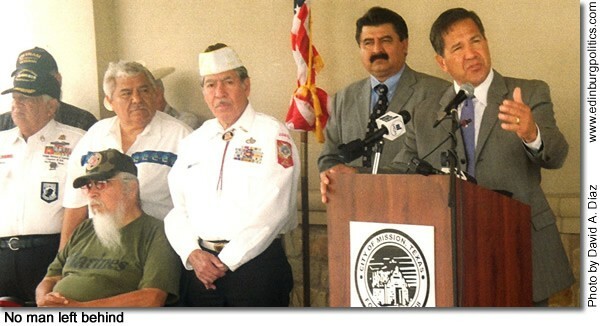 "Featured, front row, from left: Ruben Cantú, Chapter 21 Commander, Disabled American Veterans (DAV), of Harlingen; Sen. Lucio; Rep. Peña; Emilio De Los Santos, Director, Hidalgo County Veterans Department, of Edinburg; Olie Pope, Veterans Service Officer, of Austin; and José A. Leal, Incoming Commander, DAV Chapter 121, of Harlingen. Center row, from left: Homer Gallegos, VFW Post 8788 Commander, of McAllen; and Rey Oropez, Assistant Veterans Service Officer, of Edinburg. Top row, from left: Mike Escobedo, America’s Last Patrol, of Donna; Antonio Arenas, VFW Post 8788, of McAllen; and Nicanoor R. Chávez, American Legion, of Raymondville. See story later in this posting. Sen. Eddie Lucio Jr., D-Brownsville, recently honored participants of the Texas Vietnam Memorial Highway Motorcycle Run in Austin with a Senate Resolution honoring the yearly event and all Vietnam Veterans. Lucio presented Senate Resolution 863 that recognizes the Texas Vietnam Memorial Highway Motorcycle Run held annually in March to pay tribute to Vietnam Veterans and their return home. "When I returned stateside, I recall that our military flight plane was forced to divert from its intended airport in California to Washington state due to anti-war protests at the original site," said Daniel D. Piñeda of Mercedes, a combat veteran of the U.S. Army who served in Vietnam in 1969. "Once back home in the Valley, for the most part, I, like most other Vietnam veterans, was shunned by the general public. There were no expressions of ‘welcome home soldier’ or anything of the sort." Piñeda explained that the Texas Vietnam Memorial Highway Motorcycle Run "serves to help the Vietnam veterans who were never welcomed home decades ago, but rather, if you would, just swept under the rug. As we ride from town to town in Texas along U.S. Highway 83, we see people, complete strangers, lined up cheering, waving and shouting ‘welcome home.’ It’s the patriotic display of our nation’s people honoring its forgotten veterans." Featured, front row, from left: Marietta Johnston of Junction: Alex Armendáriz of Pflugerville; Brent Jackson, founder of the Run, of Wolfforth; Richard Scibek of Houston; and Hazel Webb of Slaton. 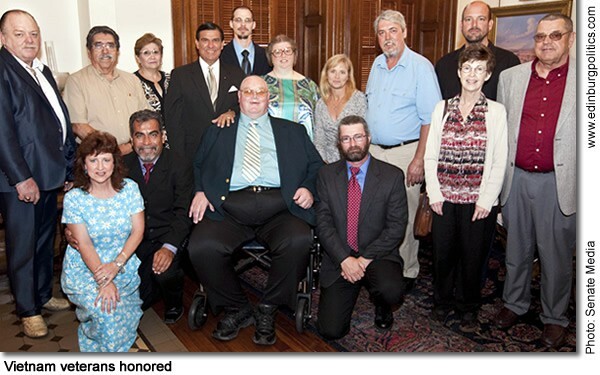 Back row, from left: Keeton Johnston of Junction; Mr. and Mrs. Pablo Aguillón of Crystal City; Sen. Lucio; Stephen Arthur of Amarillo; Brenda Jackson, co-founder of the Run, of Wolfforth; Kim Felix of Austin; Lester Nye of Granbury; Chuck Bayes of Houston; and Woody Webb, of Slaton. See story later in this posting. Hidalgo County Judge J.D. 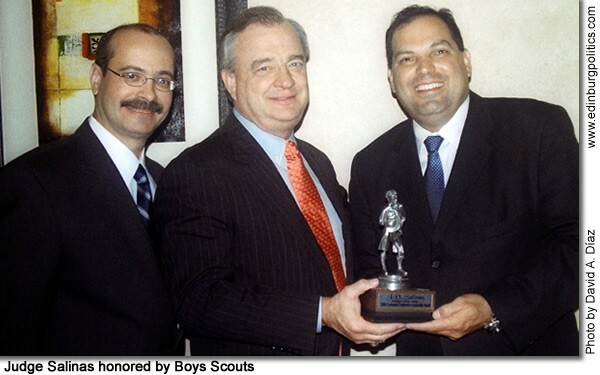 Salinas, III, featured left, accepts the "Leadership Award", bestowed by The Rio Grande Council, Boy Scouts of America, from his mentor, former Texas Comptroller John Sharp, who is accompanied by Ernesto Carballo, Scout Executive and CEO for the Rio Grande Council, Boy Scouts of America. The public ceremony was part of a fundraiser dinner for scouting in deep South Texas. The event, which was part of the scouts’ national Centennial Celebration, was held on Thursday, May 14, at The Club at Cimmaron. The successful gathering helped raise about $50,000 for Valley scouting efforts. The “Leadership Award” has been designated by the Rio Grande Council, BSA as an award to be presented to a civic, community, or business leader who has demonstrated patriotism, leadership, and service at a local, state, or national level. Sharp, who served as the keynote speaker, later said he said Valley hopes for a Veterans Administration Hospital would be greatly improved if Texas had at least one Democratic U.S. senator in Washington. Sharp is an announced Democratic candidate for U.S. Senate. U.S. Sen. Kay Bailey Hutchison, R-Texas, is expected to vacate her seat in the coming months in order to campaign for governor in the March 2010 Republican Party primary. See lead story on Sharp’s support for a state-federal partnership to build Valley VA Hospital, as envisioned by state legislation by Rep. Ismael "Kino" Flores, D-Palmview, and how Sharp says he can make a difference on that goal in securing federal funding because of his Democratic Party affiliation.